While there are notable exceptions, the following general conditions apply to most Tarantulas. Please do independent research your chosen species- there are many forums with knowledgeable and helpful people only too happy to assist. There’s no such thing as a stupid question, so don’t be afraid to ask. There are 3 groups of Tarantulas Arboreal, Terrestrial and Burrowing. Taller enclosures are best used for Tree dwelling species so they can climb. You can also use taller tanks filled deep with substrate for burrowing species. For Terrestrial species height is not so important and an enclosure 15cm high would be suitable for the majority of species. As a general rule the length of the enclosure should be 1.5x bigger than the spiders leg span. If you have a 10cm spider your enclosure should be around 25cm in length. Many species live down burrows and rarely move more than 10cm from them so not much room is needed to give a Tarantula adequate space. Many containers and tanks are suitable for housing spiders. Glass tanks can be used, though you will need to make sure there is a secure lid and ventilation. Glass can be harder to heat so you may need a larger heat mat connected to a thermostat. There are now several glass terrariums designed for exotic pets with front opening doors and ventilation on the market. Another option is to use a plastic enclosure. As these are low cost and easy to heat. You can use any correct sized plastic box, just add ventilation and you’re away. The lid must be tight-fitting as tarantulas are particularly strong and may lift a light or unsecured lid. There should be ample ventilation, even in those enclosures where humidity is important. Stagnant air can promote the growth of mould which may prove fatal to your spider. There are many low cost commercially made plastic enclosures available for Tarantulas. Tarantulas are cannibalistic so strictly one spider per enclosure. Arboreal setup on the left and Terrestrial set up on the right. Tarantulas come from warm climates and will need to be heated. As a general rule they should be kept approximately 23 -28C (75 – 85F). Scrubland Tarantulas should have a humidity level of between 60 – 75% while Rain forest species need 75-90% there are always exceptions so please research you chosen species. The most practical way to heat an enclosure is to use a Heat mat attached to one of the back walls of the enclosure. Any Heat mat larger than 15 x 28cm is best attached to a Thermostat. If you are trying to heat multiple cages run a heat strip connected to a Thermostat along a shelf or wall and place the back of the enclosures next to it. Make sure you place the heat source on only half of the enclosure. Remember that you’re trying to only heat an area in the tank to the desired temperature not the whole tank. This will create a warm spot and cool spot where the Tarantula can move around to regulate its own temperature. Tarantulas don’t like strong light and should not be heated with any type of bulb heater. The majority of spiders will thrive in an average relative humidity in the 55-70% range though the enclosures of those requiring higher humidity can be sprayed lightly with room temperature water so that the substrate becomes damp but not wet and allow the substrate to dry out a bit before spraying again. Make sure you don’t spray the spider directly unless you want a fast, angry, venom-laden beast running up your arm! Using a deeper substrate is the best way to maintain an average relative humidity and takes longer to dry out, rather than spraying just soak a little water into the substrate to re-hydrate it. A spider living in too dry an environment will often spend most of its time near or in the water bowl. It is recommended you use a Hygrometer and Thermometer to monitor you tank environment. Substrate is what you put in an enclosure for your Tarantula to live on. The best all round substrate to use for Tarantulas is (Coco Fibre). This comes in a block which you add to water and it expands into substrate. It is made from Coconut husk as usually goes under the trade names of Terra Tarantula, Eco Earth, Forest bedding, Terrarium Humus etc. If you squeeze the substrate and it binds together briefly before crumbling this is the ideal dampness you are looking for. If when you squeeze water is released it is too wet. If your spider is climbing the sides of the enclosure and not on the substrate, it is a sign it is too wet. Try not to allow the substrate to dry out completely as it will become hard to moisten again. As mentioned earlier a deep substrate is better where possible with 3 – 4 inches being ideal for most Terrestrial species. Though we don’t recommend using Vermiculite as a substrate by its self it is often mixed with coir for use with Tropical high humidity species. Sometimes with African species we will also add a little sand. Every 6 months or so replace the substrate unless it is spoiled before then. Burrowing species from Asia and African will need a lot deeper substrate no less than 8” however they don’t need so much floor space as they will build chambers in there burrows. The first requirement is to create a hiding place for you spider as they are essentially nocturnal (active at night & inactive by day) and will need a dark shelter to hide during the day. There are several commercially made shelters available that look naturalistic as well as Cork bark pieces and tubes which don’t go mouldy like other types of wood. A simple shelter can be made using half a flower pot which you sink into the substrate and then cover the top with more substrate leaving an entrance hole for the spider to enter. Tarantulas will often dig in the substrate and web around their shelter. You will also need to include a water bowl for drinking. You could use any plastic bowl or container but there are water bowls built specifically for Tarantulas that do not tip over easily and have a ledge so crickets can climb out. Aside from a source of water for the animal, a water bowl helps increase the humidity of the enclosure. Water should be changed every two or three days. There are various “Bug Gel” products in the pet trade which is a water based jelly which should be avoided, though good for livefoods and Roaches it is not suitable for spiders. The above two items are the only essential items. Other items of decoration like artificial plants moss and bark can also be added but make sure you don’t take up to much floor space. Avoid adding sharp objects (Cactus) and rocks into the enclosure which may potentially harm the spider. Without exception, all tarantulas are predators and the mainstay of their captive diet is live crickets, but they will take a wide variety of insects like mealworms, locusts and roaches. These are readily available through the web and at many pet-shops. Always transfer them from the box in which they were purchased into a suitable larger container with a few egg boxes piled haphazardly. Never feed wild caught insects to your animals as there is a strong likelihood that they will have come into contact with pesticides. 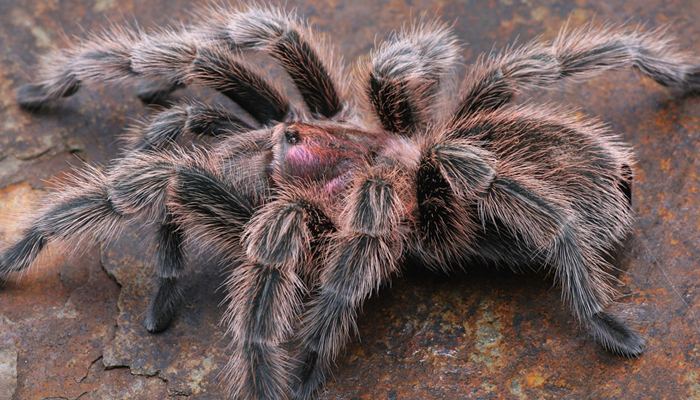 While resistances build up in animals regularly exposed to pesticides, your tarantula will have no such resistance and any contact is likely to prove fatal. The quality of the prey directly affects the health of your tarantula. Crickets and the like should be gut loaded – fed a varied and nutritious diet. As well as commercially made Cricket diets you can also use dried dog food and an assortment of fresh vegetables, changed every two days. Leafy greens, carrot strips, apple strips and the like are all suitable. As a general rule tarantulas will readily eat food items which are half their own body length or less. A typical-sized, adult tarantula will be content with four large crickets per week. They don’t need to be fed very frequently; you can give them all the crickets at once and that will be fine for the rest of the week. Make sure you don’t over feed your Tarantulas. The abdomen should not be more than twice the size of the carapace. If it is, the spider is overfed and this could affect it during a moult. Spiders can go without food for days, weeks and sometimes months, it is usual for spiders to stop feeding for prolonged periods of time, so don’t worry. If it’s not losing lots of body mass then it will be fine. Feeding your spider once or twice a week should be sufficient. Please note that black crickets are omnivorous and have quite strong jaws so should be removed after 24 hours if not eaten. Spiders will also stop feeding before moulting and should not be fed during this time. When a tarantula has finished feeding it will leave a small ball of indigestible leftovers. These should be removed from the tank during routine maintenance (long tweezers are useful here). Tarantulas produce negligible amounts of faeces (tiny white packages) and as a result, don’t need to be cleaned-out like other small animals. Crickets and Locusts make ideal food for Spiders. Spiders have a tough exoskeleton that can only expand so much. Consequently, as the spider grows it must shed its skin (moulting or ecdysis). This is an incredibly stressful time for the tarantula as it is completely defenceless during the moult. There are three stages – pre-moult, moult and post-moult. The frequency of moults is age-dependant, with spiderlings moulting once every month or two to some adults moulting only once every 18 months – 2 years. In pre-moult, the spider starts to look dull and will go off its food. They may seal themselves inside their burrow or hide. This can last from a day or two in Spiderlings to three months or more for adults and sub-adults. The actual moult only lasts an hour or two and is usually performed lying on its back. (If you see a tarantula lying on its back it’s not dead, just in moult. Dead spiders are usually right side up with their legs curled up under them – the Death Curl). The moult usually occurs at night, but if you’re lucky enough to witness it, you will see a white, soft spider come out of the shed skin (the exuvium). NEVER disturb a spider in moult or pre-moult: it can cause severe problems. The post-moult phase again varies depending on the age of the animal, with spiderlings active again after as little as 24 hours. Adults can take 4 – 6 weeks to behave “normally” once more. After a moult the exoskeleton including the fangs and certain internal features remain soft for a while. It may be beneficial to increase enclosure humidity slightly during the moulting process. Going through the moulting process. The general rule is Don’t! This is not due to the venom or defensive nature of the spider but for its protection. Spiders are not geared up for handling and any attempt to do so will likely be perceived as a threat and scare the animal which could cause them to bolt suddenly and fall. Even a fall of a few inches is sufficient to kill many tarantulas, especially those of large body size. Research your chosen species to check suitability for handling and only do so when sat on the floor or over a desk to minimise the risk of injury should the animal fall. Certain spiders are deemed more defensive than others and will not hesitate to bite. While there has never been a human death directly attributable to a tarantula bite, some species carry venom of significant potency that can cause severe systematic effects for a week or more (most notably the Indian Ornamental tarantulas and certain of the African baboon spiders). Needless to say, these spiders should not be handled. It is a general rule that New World tarantulas are less prone to biting and have significantly less potent venom than Old World Species. This is due to their possessing a different means of primary defence – urticating “hairs” (setae). These are specially adapted to break off at the base and are covered in microscopic barbs that embed themselves into flesh and cause mild-to-severe reactions in people (species and allergy dependant). These setae have evolved to cause maximum discomfort when lodged in the eyes or mucus membranes of the respiratory system. For this reason, tarantulas should always be kept away from the face and hands should always be washed after handling spiders or performing tank maintenance as the hairs often break off and cover the enclosure floor and “furniture” and can be transferred via the hands to the eyes. Old World tarantulas do not possess the urticating setae and rely on speed, hiding and (usually as a last resort) biting as their primary means of defence. Note the use of the word “defensive” rather than “aggressive”. While there are exceptions, even within the same species, tarantulas are not aggressive animals, only reacting in defence to a perceived threat. Nothing! The whole transport and rehousing process is an ordeal for tarantulas, so once you’ve got it home and installed in its enclosure (with suitable temperature, substrate, hide and water bowl) LEAVE IT ALONE for 3 or 4 days. During this time it will gradually explore its surroundings, laying down strands of web that carries its own scent markers (tarantulas smell and taste through their feet and legs as well as other areas of the body). Soon it will feel “at home”. After a few days, feed it a small meal – maybe one or two crickets. Treat as normal after a week or so. A massive Thanks to David Kelly and Richard Gallon for helping put this care guide together.